1. There's not much to report in terms of injury updates this week as the team was off for four days due to the all-star break. Josh Donaldson is continuing to progress with his running program but there is no definitive timeline for his return. It's doubtful he'll return before the non-waiver trade deadline, meaning he'll almost certainly be a Blue Jay after July 31st. He is a free agent after this season. It's very likely he'll accept a qualifying offer from the team. I don't see another team taking a chance on him with his injury history the past couple of seasons and him being three years removed from his MVP season. 3. JA Happ had his first career save in the all-star game Tuesday. He gave up a lead-off HR to Canadian Joey Votto on the first pitch but then struck out Christian Yelich, got Charlie Blackmon to ground out to 1st and Lorenzo Cain to fly out to right. Happ made what is likely his final start in a Blue Jays uniform. He has had 2 stints as a Blue Jay; 2012-2014 and 2016-present. Happ has a career 59-41 with a 3.89 ERA in 134 games (126 starts) in a Blue Jays uniform. The Yankees, Brewers and Cibs have all expressed interest in acquiring the 35-year old starter. On Sunday, Happ threw 5 strong innings and struck out 5 batters in the first 2 innings and 9 overall. If this was Happ's final start as a Blue Jay, fans definitely saw Happ at his best. His command was excellent from the get-go and he and Russell Martin made a great battery team on Sunday. 4. The Blue Jays may be limited for what they can do at the trade deadline due to poor performances and injuries. I can see a couple of the relievers (Ryan Tepera, Tyler Clippard, John Axford and/or Seunghwan Oh) being dealt to contending teams and maybe Curtis Granderson or Justin Smoak. The Blue Jays will be looking for controllable players in return that can shape the future of this team. 5. The biggest name likely to be dealt in Manny Machado was traded from the Baltimore Orioles to the LA Dodgers for 5 Dodgers prospects. In his career as an Oriole, Machado hit .283 with 162HR, 471RBI, 10 triples and 197 doubles. He was batting .315 this season with 24HR and 65RBI. In his Dodgers devut Friday, Machado was 2-3 with a pair of singles and a pair of walks. 6. On Thursday, the Padres traded relievers Adam Cimber and Brad Hand to the Cleveland Indians for prospect catcher Francisco Mejia. The Indians bullpen has had a difficult time holding leads through to the 9th inning and Andrew Miller has been injured. Hand has a 2-4 record and 24 saves with a 3.05 ERA in 41 appearances this season. In his Indians debut, Hand pitched an inning, giving up a solo HR and striking out a batter. Cimber has a 3-5 record with a 3.15 ERA in 42 appearances for the Padres. In his debut for the Indians, Cimber threw 0.2 innings and gave up 1 hit. 7. On Saturday, the Mets traded away closer Jeurys Familia to the Oakland A's for a pair of prospects. Familia was 4-4 with a 2.88 ERA and 17 saves in 40 appearances this season. As a Met, Familia had a 13-17 record with a 2.66 career ERA and 123 saves and 313 appearances over 7 seasons. He started one game in 2012, but has been used as a reliever ever since. 8. Here are a list of 10 problems that teams will be looking to shore up. Will every one of these problems be solved through the trade deadline route? It largely depends on what teams are willing to spend to get the desired player. Also factoring in will be how close the team feels it is to winning. For example, a team like the Red Sox and Astros will be looking to add pieces for depth and to give them that edge over the competition, but they may not feel as desperate as a team fighting just to make the playoffs, such as the Oakland A's, who just dealt for Familia, or any of the teams in the NL West but the Padres, where the 4th place San Francisco Giants are just 4 games back of the first place LA Dodgers. It will certainly be interesting to see what moves are made in the next week. 9. The second last thought this week comes from a super slow pitch from Milwaukee Brewers infielder Herman Perez. Being blown out by the LA Dodgers, the Brewers opted to use 2 position players on Sunday and backup catcher Erik Kratz, who evidently learned a mean knuckleball from RA Dickey or Tim Wakefield. The Blue Jays Kendrys Morales pitched an inning back on May 20th against Oakland. Although not ideal, position players tend to be used as pitchers in blow outs or lengthy games when a team runs out of pitchers. Perhaps one day we'll see Russell Martin take off his catching gear and pitch to Luke Maile. This scenario could be more likely in August when the team faces a tough stretch when they play August 7-22 without having an off-day. They also play September 11-26 with no off-day but rosters will expand in that month so it is less likely a position player would be used to pitch. 10. Blue Jay of the week: JA Happ who was great in what might have been his final start in a Blue Jays uniform. Happ also picked up his first career save this week in the all-star game, the first appearance in the mid-summer classic for the 35-year-old southpaw. As mentioned above, Happ had 2 stints in a Blue Jays uniform and this most recent one was by far his best. 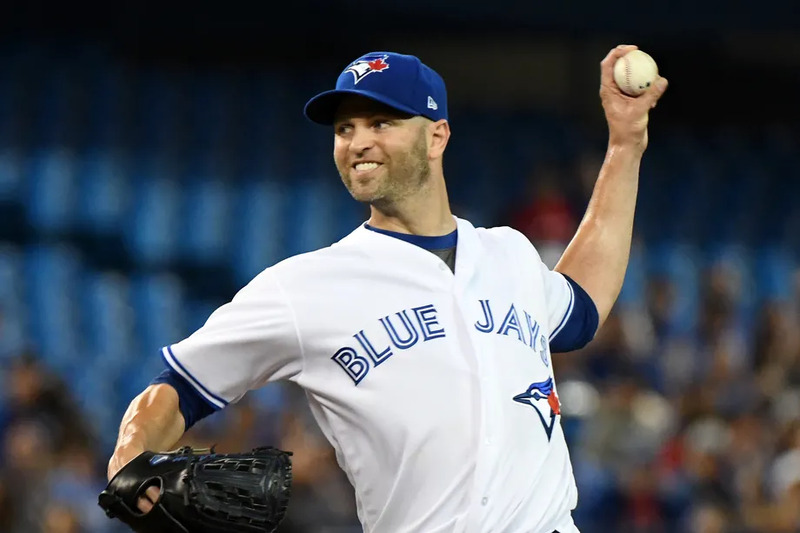 I expect Happ to be traded this week and whether he makes his next scheduled start on Friday will be largely dependent on how close the Blue Jays are to a deal to trade him or if the trade has already happened.